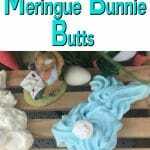 This is a throwback Easter craft from years gone by! Or at least in this household as for many years there was a beautiful Easter Egg Tree that was brought out for the Easter holidays. It made a fun and festive Easter centerpiece! Fast forward and this year is the Dollar Store Easter Egg Tree to add to the Easter decorations. This Easter Egg Tree was made with materials from the yard and the dollar store. The dollar store in my area is a treasure trove for craft materials and the brand is the exact same as the big box craft store. How lucky to be so close to a crafty dollar store! This was a very simple and very quick Easter craft. Any age can make an Easter egg decoration for the Easter Egg Tree! 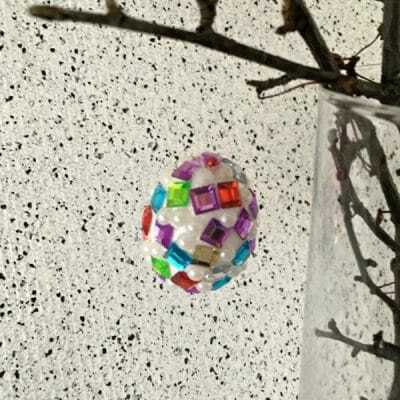 The button Easter Egg Tree decorations are made with buttons from the dollar store or from the craft stash. If making a button Easter egg I recommend covering the styrofoam egg with magic marker in a color which is compatible with the buttons. This is optional; however, the white on the plain styrofoam egg can show through the buttons. It only takes a minute to lightly and quickly cover the egg with magic marker. Place the button on the styrofoam egg in the desired location. Gently insert the straight pin through the hole in the button and firmly press in the styrofoam egg. The buttons can be placed side by side or can overlap each other. It is totally personal preference as either technique will work equally well. 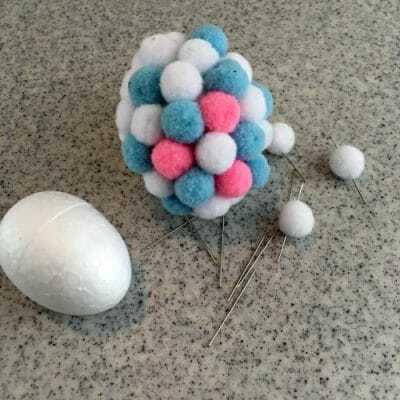 This Easter Egg is made with straight pins and pom poms. Place the pom pom on the desired location on the styrofoam egg. Spear the pom pom with the straight pin and gently push the pin through the pom pom and into the styrofoam egg. 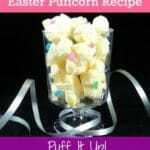 Pastel pom poms work very well for the Spring Easter theme. This is one of my favorites! The dollar store has a huge selection of jeweled stickers and are perfect to make a jeweled Easter egg in vibrant colors. 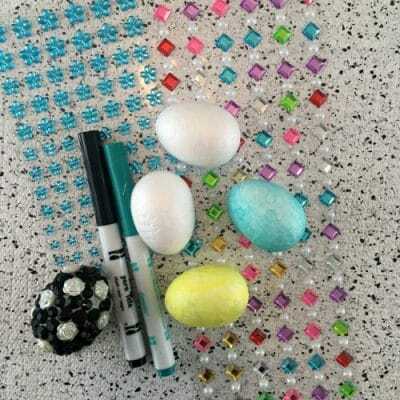 Color the egg with magic markers just like the beaded Easter Egg above. Choose a magic marker color with is similar to the sticky jewels chosen for the egg. Stick the jewels on the egg in the desired location. Any design will do! It is that easy! One egg can be made in under 10 minutes. 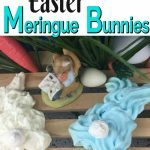 This is a great Easter craft for the younger kids as no glue is necessary which makes clean up and crafting so much easier. Ribbon or invisible thread can be used to make the hanger. I like the invisible thread. Make a loop with the invisible thread and tie both ends into one knot. Leave enough length to easily make two more knots. Lay the top of straight pin (with the round head) on the knot. Take the ends and double knot with the straight pin head in the middle of the knot. Insert the straight pin into the middle of the top of the Easter Egg. Arrange the branches in a glass cylinder vase. 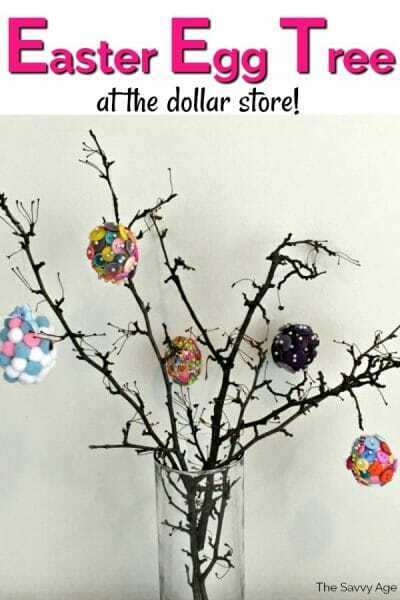 Hang the Easter Eggs on the Dollar Store Easter Egg Tree! Stand back to visually evaluate if the eggs are placed where desired. Mix, match and have fun! More Dollar Store Tree Crafts! 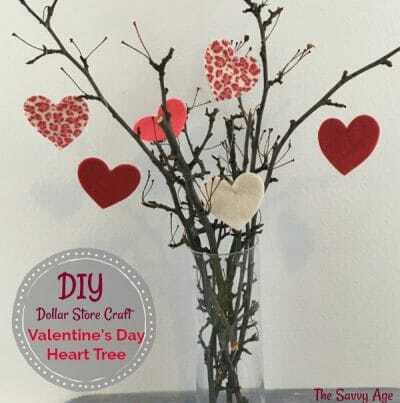 This was a fun little Dollar Store Valentine’s Day Tree made just as the Easter Egg Tree was crafted. The ornaments are made from a package of foam hearts from the Dollar Store so it is named the $1.00 Valentine’s Day tree! Use foam hearts or any large foam stickers to make the tree decorations and customize the colors for Easter.